On November 22, 1963, President John F. Kennedy was assassinated as his motorcade drove past crowds in Dallas Texas. On November 22, 2013 it will have been fifty years since the death of one of America’s most loved presidents. No one was ever convicted but most people believe that Lee Harvey Oswald was responsible. Oswald was shot and killed before he was put on trial. Kennedy who was born in Brookline Massachusetts in 1917, ran for the Presidency in 1960. Kennedy narrowly won the race against Richard Nixon who was vice president at the time. Kennedy came into office during the heat of the Cold War between Communist Soviet Union and America’s Democratic system of government. His handling of the Cuban Missile Crisis was one of Kennedy’s biggest accomplishments during his time as President. In 1962 an American spy plane photographed the Soviets assembling nuclear missile launchers in Cuba. Kennedy and his advisers decided to set up a naval blockade around Cuba. Several days later Khrushchev the leader of the Soviet Union agreed to remove the missiles as long as America promised not to invade Cuba. Some of Kennedy’s other accomplishments as President include establishing the Peace Corps, putting more money into the space program and signing a treaty with the Soviet Union banning nuclear testing. 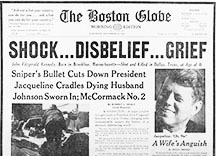 Kennedy’s death saddened Americans greatly. Hundreds of thousands of people attended his funeral in Washington and millions watched it on television. Although he spent only a short 1,036 days in office, he will always be remembered as one of America’s greatest presidents.